FFWPU Canada: Vancouver, for the past two months, hardly experienced any rain. However, on the very day of their Vancouver Peace Road rally, it poured like a typical summer day in Vancouver. 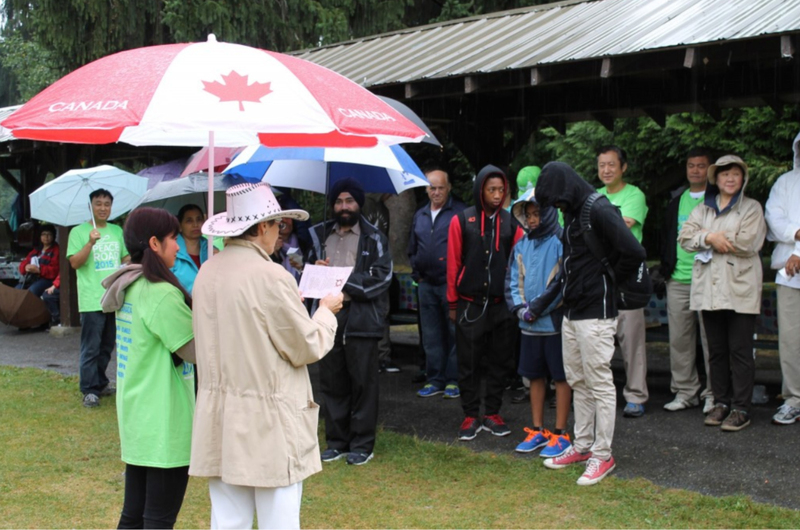 Despite such weather, more than 70 Unificationists, Ambassadors for Peace, friends and families stood together at Bear Creek Park on Sunday, July 26 to rally for global peace. After the song, Rev. Alan Wilding led the crowd in reciting loudly, “Victory for God and True Parents! Victory for One Family under God!” As they cheered, Rev. and Mrs. Kambashi released dozens of colorful balloons up into the Vancouver sky, representing peace over the land. Rain or shine, Rev. and Mrs. Moon devoted their lives every day for world peace. Participants in Vancouver felt Rev. and Mrs. Moon were walking with them in spirit. Next they will pass on the flag to Alaska as the Peace Road rally continues!